Oh yumm! This is so quick and easy for a weeknight meal! Set oven to 350. Spray 13x9 pan with cooking spray. Spread frozen hashbrowns on bottom of pan, top with green beans, spreading evenly over potatoes. Brown hamburger with onion. Stir garlic powder and black pepper into hamburger/onion mixture and spoon over green beans. Mix cream of mushroom soup, sour cream, Worcestershire sauce and milk until smooth; pour over hamburger mixture. Top with 6 slices Velvetta cheese, evenly spaced over top of casserole. Bake, covered with aluminum foil 1 hour. 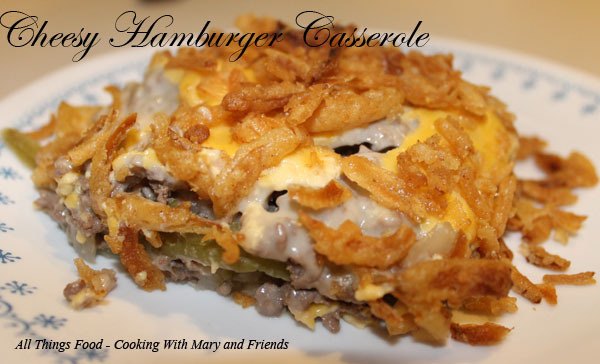 Remove aluminum foil and sprinkle with French fried onions. Continue baking 10 minutes or until onions are browned.